Among the classic Hanoi dishes are deep-fried sweet potato and shrimp fritters. Called bánh tôm, they’re eaten as herb-and-lettuce wraps, dunked in nuoc cham dipping sauce. When I don’t have the energy to tackle the tricky original, which entails deep-frying fritters of battered sweet potato sticks with whole shrimp attached, without things falling about, I make my streamlined workaround: these delicately crisp sweet potato pancakes. I blend grated sweet potato with grated carrot. Seasoning with green onion and fish sauce imbues the pancakes with some of the pungency and umami depth of the original. They come together handily with little fuss. At the store, choose your sweet potatoes wisely. White sweet potatoes are dry-ish and fry up crisper than their orange-fleshed friends, so these are preferred. This said, it’s fine to use orange-fleshed sweet potatoes if your grocery store doesn’t carry the white ones; your pancakes will just be a bit less crispy. If sweet potatoes aren’t available, or you prefer a more savory pancake, use a Russet potato, though the resulting pancakes will be less crispy and not sweet-savory, which is part of the allure of these morsels. Because you’ll be peeling and grating the potato and carrot, expect some ingredient waste during prep. To hit the right quantity for the recipe and to avoid scraping your fingers on the grater trying to get every last bit, buy a little more than what’s needed. To grate the potato and carrot, employ the largest holes on a box grater. (Or cut the vegetables into big chunks and put them through the large shredding disk of a food processor.) You want them to retain some character and texture. Massaging salt into the vegetables quickly forces out moisture, the enemy of pancake crispiness. Shop for soft leaf lettuce, such as butter (Boston) or red leaf, or green leaf. Their leaves are tender and easy to manipulate (if the leaves are huge, cut or tear them into palm-size pieces). Romaine and iceberg are too crisp to easily fold around all the goodies that you’ll be wrapping up. The lettuce and herbs may be washed, spun dry, and refrigerated in separate zip-top bags up to one week in advance. On the day you want to serve the dish, you can make the sauce up to eight hours before serving, cover it with plastic wrap, and set aside at room temperature. If you want to retain bright chile heat, add it to the sauce before serving. Either the night before or a few hours before cooking, you can also prep the veggies, cover, and chill. Then mix with the remaining ingredients and fry. To make the pancakes up to four hours before serving, slightly under-fry them, then cool them on a wire rack. Partially cover with aluminum foil and let them hang out at room temperature. About 15 minutes before serving, refry the pancakes over medium-low heat to crisp and finish. 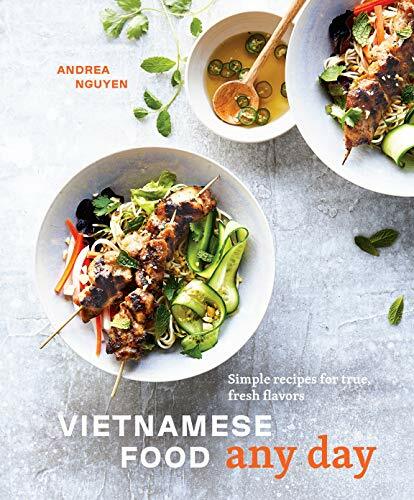 Whether made ahead and enjoyed at the table, or prepared on the spot and eaten at the kitchen counter, these pancakes are a terrific way to savor Viet flavors. They’re great as a snack, or paired with curry-scented beef for a lettuce wrap feast! Or double the recipe, and eat them for dinner! If you can't find white sweet potatoes, swap for orange-fleshed sweet potatoes. This recipe is easily doubled to feed a larger crowd or serve as a meal. 1 Make the nuoc cham sauce: Combine 1 tablespoon of the sugar, 1 1/2 tablespoons of the lime juice, and the water. Taste the limeade, and if needed, add the remaining 1 teaspoon sugar and/or 1 1/2 teaspoons lime juice; dilute with water if you go too far. If there’s an unpleasant tart-bitter edge, add the vinegar to rounds things out. Finally, add the fish sauce to create a bold, forward finish. If desired, add the chiles and/or garlic. Set aside. You should have 1/2 cup of nuoc cham, and this can be made and refrigerated up to 8 hours before serving. 2 Salt and squeeze out the sweet potato and carrot: In a large bowl, combine the grated sweet potato, carrot, and salt. Massage with both hands until wet and squishy, about 1 minute. Transfer the grated veggies to a piece of muslin or a non-terry dish towel, and wrap the veggies in the towel. Standing over the sink, firmly squeeze and twist to expel moisture. Dump the veggies into a dry bowl. 3 Assemble the pancake batter: Add the green onion, mixing with a fork to distribute well. Mix in the pepper, fish sauce, cornstarch, and rice flour. Add the egg, break it up with a fork, and mix well. Press the mixture down to compact it, and then divide into 8 portions like a pie, using a 1/4 cup measuring scoop. 4 Fry the pancakes: Warm a large nonstick skillet over medium heat, then add about 2 tablespoons of oil to film the bottom. Fry in two batches, 4 pancakes at a time. For each one, use a fork and your fingers to scoop up the 1/4 cup portions of the potato-and-carrot mixture (one wedge of the "pie"). Deposit into the skillet, spreading and flattening the mixture with the measuring cup bottom and fork to make a 3 1/2-inch-wide pancake (mine often look like Australia). Fry for about 3 minutes longer, until crisp and brown underneath. Cool on a rack. Fry the remaining batch. 5 Assemble and serve the lettuce wraps: Serve with the lettuce, herbs, and sauce. Invite guests to build their own lettuce leaf wraps containing a piece of pancake (pass scissors or use forks/fingers to break up the pancakes into smaller pieces suitable for wrapping up), with 2 or 3 herb leaves and/or torn cilantro sprigs. Dip in the sauce and eat. These are really best the day they are made. Hello! All photos and content are copyright protected. Please do not use our photos without prior written permission. If you wish to republish this recipe, please rewrite the recipe in your own unique words and link back to Crispy Sweet Potato Pancake Lettuce Wraps on Simply Recipes. Thank you!